Felts play an important role as far as efficiency and consumption are concerned. Leizhan has designed and made customized felts to meet customer’s requirement for high efficiency and better dewatering effect. The superior quality of Leizhan felts also ensure long service life and excellent performance. 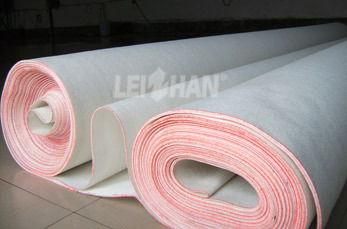 Leizhan various felts used for tissue paper manufacturing process can achieve high pressure resistance and energy saving. Felts can be used in the forming section, press section, dryer section, and sizing section of paper making machine. It is quite important to make the right felt choices and Leizhan engineer will provide appropriate felt solution which is suitable for our customer. Leizhan felts supplied for papermaker are some special felts which are used for very demanding machines, like high speed top-grade tissue machines, higher speed paperboard, stationery paper and special paper machines. Better drainability and long service life.